Red Savina Habanero Chiles are the hot of the hot. Behind the heat is a fruity flavor that makes these chiles a wonderful way to spark up a dish - but use these chiles sparingly! The name of this chile comes from the phrase "la Habana" that means "from Havana." It is a round, oblong chile about 2 inches long and 1 inch across. On the heat scale the Habanero is a 10. 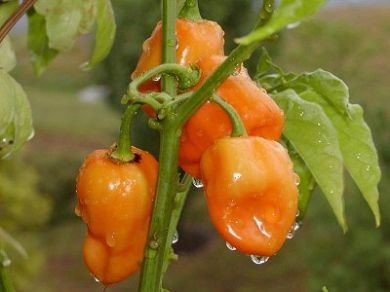 The Habanero powder is made out of ground whole Habanero including the seeds. The Red Savina Habanero powder is 100% pure. Use rubber gloves when handling the Red Savina Habanero Pepper. Approx. Scoville heat units 300,000 to 400,000. Red Savina Habanero Chiles are very, very hot!!! Use them sparingly. Add a little to fresh salsa, sauces, chili and anything else you want to start a 4 alarm fire with! Great in Tortilla soup and other Mexican recipes. Extra Hot Dried Red Savina Habanero Chiles.